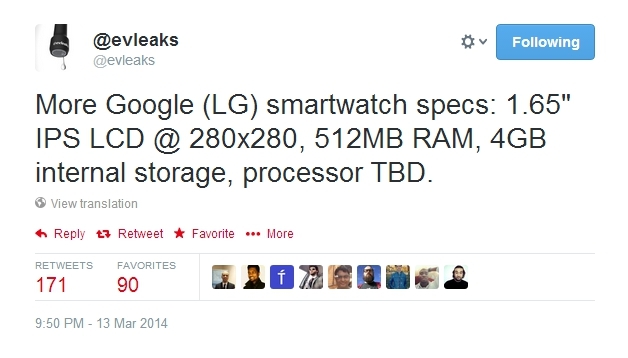 We all know that a Google smartwatch made by LG is in the works and now, we have the specs of the same. The specs of the Google smartwatch has leaked, thanks to ever reliable @evleaks. The LG built Google smartwatch will feature a 1.65-inch IPS LCD display of 280×280 pixels resolution. It means the display will be square like most of the smartwatches. While we don’t know about the chipset as of yet, we know there will be 512MB RAM and 4GB internal storage. That’s it from the hardware side, we have a few assumptions through various rumors on the software that will be part of the Google smartwatch. It is almost confirmed that the software will be based on Google Now, which is great considering how much we love Google Now and its contextual notifications. Google recently announced that the Android SDK for wearables will come in a couple of weeks. So, yes, Google is already working on the software for its smartwatch. We recently came across leaked pictures of the Google smartwatch made by Motorola, which was shelved but it is all but confirmed that the Google smartwatch by LG will surely see the light of the day. So, anyone excited about the Google smartwatch?